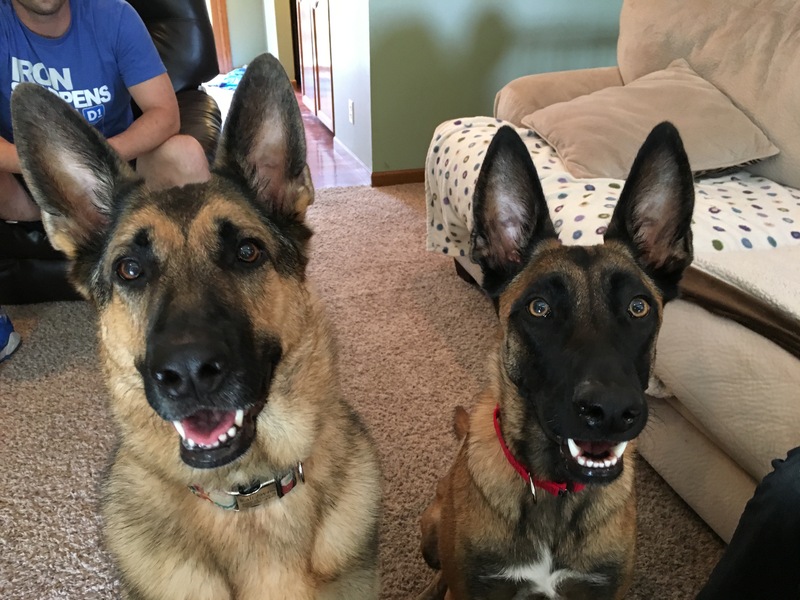 Four-year-old German Shepherd Kali (left) and one-year-old Belgian Malinois Kya’s guardians set up a dog obedience training session with us to help Kya learn to listen and behave better. I had brought my apprentice Sam along to shadow me during the session and Kia continually invaded her personal space and tried to jump up on her. Usually I like to let a dog do whatever it feels like doing during the initial consultation so I can get a good feel for the dog’s normal behavior. Sam started to stand up to claim her personal space when Kya got too close or jumped up. While the behavior was not at all aggressive, it’s certainly not something that you want your dog to do to guests. If the behavior continues unchecked this can give the dog the impression that it has dominance over humans outside of its guardians. I have seen situations where the playful jumping becomes dominant and aggressive. After Kya jumped up on Sam for the sixth or seventh time, I stood up and demonstrated a technique that I developed a couple of years ago. The concept is to basically hold the dog in the up position that it places itself in and not allow it to get down right away. This sends a message to the dog that if you jump up on a human, the human decides when you get down. Ive used this technique with hundreds of dogs and I’ve always been able to get a dog to stop jumping up right away. It’s important to remember that when a dog invades your personal space this way it is showing that it holds no respect for you as an authority figure. Now for puppies, this can be simply a playful activity. But in grown dogs, this interaction can lead the dog into thinking that it is OK to physically contact or correct humans. This frequently leads to a lot of really bad and undesirable behaviors. Although Kya did protest when I refused to allow her to get down when she wanted to, I only needed to apply the correction once to stop her from jumping up on the Sam and myself. We sat in the living room and discussed the dogs day-to-day routine. I wanted to get a feel for any rules, boundaries or limits that the guardian had in place. This structure helps a dog identify as being in a follower position. Dogs who feel in charge often get stressed out by feeling responsible for the humans they live with. After thinking about it for a bit, the guardian came up with a number of commands that they dogs obeyed. Its clear that both Kali and Kya are smart dogs, but there is a difference between rules and commands. If a dog doesn’t have many limits, it can give the dog the impression it has the same authority as the humans. If a dog thinks this way, then listening to your commands and corrections becomes completely optional. Now Kali clearly saw her guardian as an authority figure and was well mannered. But Kya was all over the place; jumping up, invading personal space and not responding when the humans corrected or disagreed with her. Additionally, I saw the guardian petting Kya whenever she got close. While this in itself inst a bad thing, Kya continually got right up in his face to ask for this attention when it wasn’t immediately offered. I hate to ever say that petting a dog can be problematic, but if we give a dog everything it wants, it can give the dog the impression that it has more authority than humans. Over time, this can lead to an erosion of the dog’s confidence and in many cases create a case of separation anxiety as the dog feels incomplete unless the human is there. I originally thought the dogs both had a good level of confidence but when I attempted to place Kyle on a leash, she panicked and reacted in a way that I have never seen before. As soon as I had put the leash on Kya, she started to get very tense, her pupils dilated, pulled her lips and ears back and started to breathe heavily. I took a step forward and simultaneously dropped the leash but it was an awkward drop. Kya was backing up with such intensity that as soon as I let the leash go, she fell onto her back which I think startled her. When a dog encounters something that is new or unknown, it is not unusual for them to be cautious or shy away from it. But applying a collar or leash should never have this effect on a dog unless it’s feral or done in an aggressive or abusive way. Neither was the case here. As soon as Kia moved to the top of the stairs on the far side of the room, her guardian immediately started to call over to her telling her it was OK. I asked him to refrain from doing so and could tell that it was killing him not to go over and scoop up his dog into his arms and hug and caress her to make her feel better. The problem with this reaction is that anything that a dog is doing when we pet it is what we are reinforcing. I have had literally hundreds of clients who have made their dogs anxious and nervous by constantly petting them when they are in an unbalanced state of mind. Our intention is to console the dog, but what we end up doing is reinforcing the exact behavior we’re trying to eliminate. I asked the guardian to stay put and we waited a couple of minutes. My goal was to get Kya to feel as if she was an outsider and create a longing to be a part of the group so she came over to us on her own. After a couple minutes, Kya didn’t show much change in her demeanor and the guardian was having a difficult time not looking over at her. It was clear that he was heartbroken to see his dog in distress. Clearly he loves her a great deal, but my concern was that providing attention or affection when a dog is in this unbalanced state of mind would only reinforce this fearful reaction. Eventually I started to utilize the other dog Kali and some high-value treats to try to motivate Kya to come out of the corner on her own. While we want to do what’s best for our dogs, doing it for them can ultimately handicap the dog as it ends up expecting the humans to solve all of their problems. It took a couple of minutes and Kali gobbling up many high-value treats, but eventually we got Kya to come up off of the stairs on her own. Helping Kia take these first steps on her own without her guardian’s assistance was a very powerful and healthy part of the rehabilitation process. I know it was very difficult for her guardian to restrain himself, but he did a great job of taking it slow and letting his dog come to him. It can be unnerving for a guardian to see their dog react in a way that is unexpected and clearly that was the case here. As I mentioned earlier I’ve never seen a dog react so strongly to such a trivial activity. But the reality of it is, the insecurity was there all along even if it was not noticed. Now that we know that Kya has some insecurities, we can put together some things to help boost her confidence. I recommended that the guardians visit YouTube and look for 8 to 12 tricks or commands to teach Kya. If they mature one new trick or command a week and alternate who is teaching her, the guardians will deepen their bond with the dog while simultaneously building up her self-esteem and boosting her confidence. Another way that we can build up Kia’s confidence is to help her get over any fears or reactivity that she may have. Because she washed out of military dog school due to flinching a little bit when she heard gunshots, I spent a couple of minutes going over a counter conditioning exercise her guardians can use to help her get over the fear of these sounds. I was hoping that while we turned our attention towards Kali, Kya would be able to regain her confidence. But after we wrapped up filming the above video, Kya was still pretty shaken so I asked her guardian if I could take her out for a walk. Her guardian said he did not think she would allow me to take her on the walk but was willing to give it a go. I attached the leash and due to her earlier reaction I was extraordinarily gentle with her. I only used verbal cues to motivate her to move forward and refrained from replying any tension or correction on the leash. The walk was pretty uneventful. I stopped frequently and asked her to sit or lay down so that I can provide her with some positive reinforcement. This helped a bit and she wasn’t fearful or shying away from me, but her confidence was still shaken. When we returned to her home we headed outside to go over an exercise that teaches a dog to walk in the heel position. But we add a twist to this exercise. We do leash training without the leash. It only took a minute before Kya was back to her original self. You could see a bounce in her step when Sam led her through the heel exercise. Man is this dog quick. She really got it fast and you could tell she was enjoying herself. The guardians took turns in running Kya through the exercise next and she continued to excel. Because she responded so well, I suggested that the guardians look into enrolling Kya into agility or flyable training. These activities will boost her confidence and let her unleash her athletic potential. I could see Kya dominating at either activity. Because dogs spend up to 90% of their time in the wild looking for food, I suggested that the guardians incorporate structure into meal time. It was challenging for Kya who had to be corrected numerous times. But Im guessing due to her intelligence this won’t happen at the next meal. By the end of the session, Kya had regained her confidence and composure and was even showing respect for people’s personal space. Adding in some rules while teaching her new tricks and commands will allow Kya to feel good about things that she earns herself. Throw in agility training or other high energy activity and its a safe bet that Kya gets so confident and obedient that she is ready to show the military what they missed out on.